What turns a man into a killer? Can simple words drive a man to commit murder? Detective Jason Strong must find a killer whose signature is a wine glass. That's about all the police know, except that his victims all share certain similarities. The case gets personal when someone close to Jason is targeted, and time begins to run out. In the exciting follow-up to Where's My Son?, Jason is pushed to find a way to solve this case, before the unthinkable happens. Well, Bloodstain is your typical cliched 'young pretty' damsel in distress needing to be rescued tale. There is no mystery, no thrill, or suspense what so ever, but the story was interesting enough to be entertaining. The book was extremely short compared to books I normally listen to, but the story line was still very good. It just didn't have a lot of depth and extra fluff. It was straight and to the point. What about Paul Heitsch’s performance did you like? The audio was great. He had emotion in his voice, he wasn't just reading the book. No. You can very easily listen to it in one sitting since it is not very long. But during breaks, I did not find myself longing to find out what would happen next. I did want to listen to the rest, but it wasn't on my mind 24/7. The book was very enjoyable! It's a detective book about trying to find a serial killer before they kill again. Very well written and wonderful audio. what a fantastic exciting story. What made the experience of listening to Bloodstain: Det. Jason Strong the most enjoyable? Everything! The characters, the story line, all of it. When the last victim was abducted, I wasn't expecting that! What does Paul Heitsch bring to the story that you wouldn’t experience if you just read the book? Life. Hearing the story was like watching a really good detective show on tv. Plus, I sure am glad that he didn't give the female characters in the book a "Minnie Mouse" voice to them. You can hear the slight change in his tone from Jason to female, but he doesn't try to DO a female voice. Nicely done Paul! Ooooh, yes. But I can't tell you or I would spoil the whole thing for you. The deep friendship you feel between Jason and Vanessa is very real, and that is what makes you feel at home sort of speak with the book. 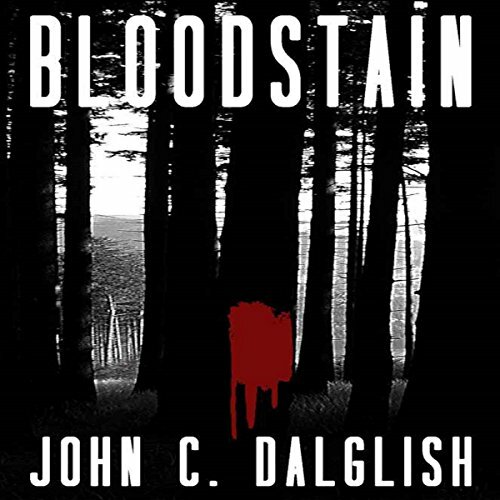 Bloodstain is a relative short story about a serial killer who leaves a trademark wine glass at each murder scene. He targets certain women who are tall, brunette and in their 20’s. Detective Jason Strong and his partner Vanessa are assigned to investigate the cases. After killing a few women, the killer then targets Vanessa after observing her at a press conference about the case. This was a pretty good story with a decent plot, which was nicely paced. However, there was little character development. I never really understood what set the serial killer off other than an insult by a girl who lived down the street. Paul Heitsch did an admirable job narrating. He brought the characters to life, drawing me into the story. I felt the urgency of Jason and the entire police department after Vanessa was abducted. I received a free copy of this book in exchange for my unbiased review. What did you like best about Bloodstain: Det. Jason Strong? What did you like least? I liked the narrator the best honestly. The story was slow and the characters didn't feel all the way fleshed out. Though if I had read the first book I may have felt differently. This felt like it could of been a very slow episode of Homicide. He brought the characters to life better than if I just had read them off the page. He gave them life and emotion. Was Bloodstain: Det. Jason Strong worth the listening time? Yes. It's a short story and good diversion from what I've been listening to lately. I enjoyed Bloodstain because of the excitement in each chapter. You had to listen to the next chapter to find out what was going to happen next. I like Jason strong the most. With Jason being in John Dalglish's books I can feel like I know him and understand him. I have a vision of what Jason should look like and how he acts. I enjoy some of the similarities in Johns books making me want to keep following his books. Have you listened to any of Paul Heitsch’s other performances before? How does this one compare? I haven't heard Paul Heitsch's in any performances before but enjoyed Bloodstain and his excitement with this book. When Jason puts all the evidence together and acts on it was very thrilling. His partner was all he could think about. I am excited to read more books by this author. I enjoy them being made in audio so that I can listen to the story while doing other things. I'm ready to hear another one.